Ready to rock your opt-in? Let’s get started! Visit the MailChimp site and click the Log In link at the top of the page. Enter your username and password, then click the Log In button. Your MailChimp Dashboard appears. 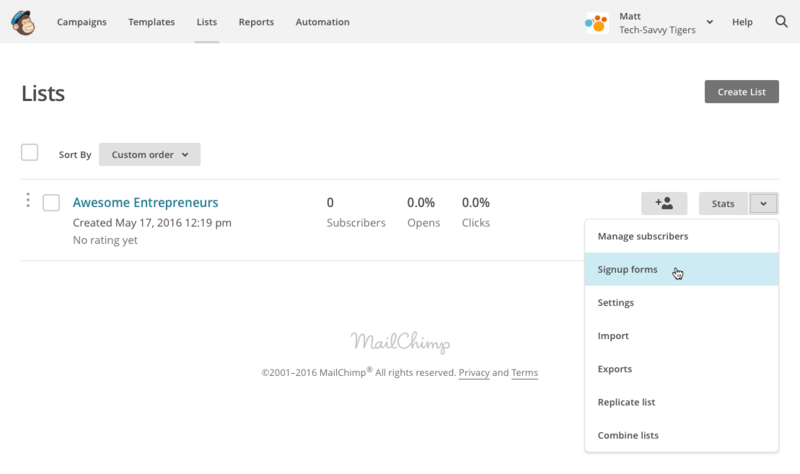 To get to the MailChimp File Manager, first click the Templates menu option, the click the File Manager button. 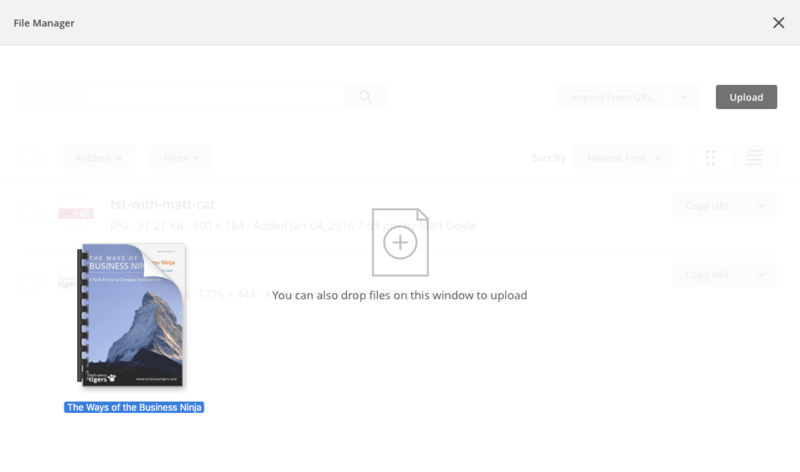 Just drag your freebie file into the File Manager window to upload it to the MailChimp server. To copy your freebie’s URL to your clipboard, click the Copy URL button next to your freebie file. Then paste the URL into a text file for safe keeping. When you’ve copied and pasted the URL, click the X in the top-right corner of the page to close the File Manager. 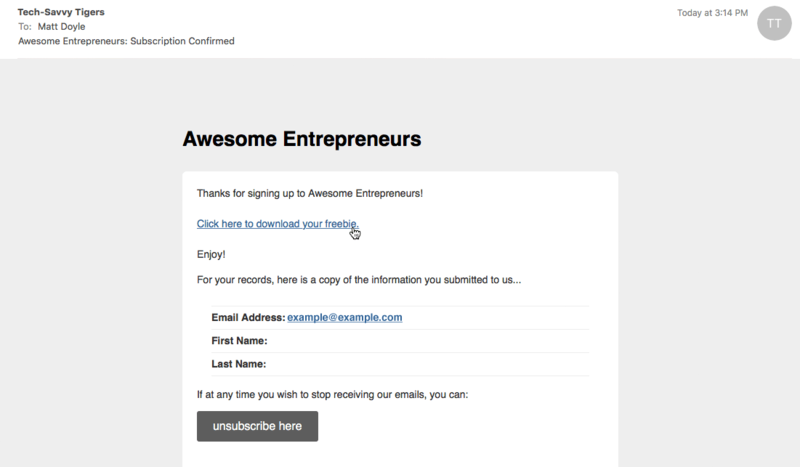 Now that you’ve uploaded your freebie to MailChimp, you want to link to it from your signup thank-you page. This lets your subscribers click the link to download the freebie once they’ve signed up. Access the signup forms for your list. 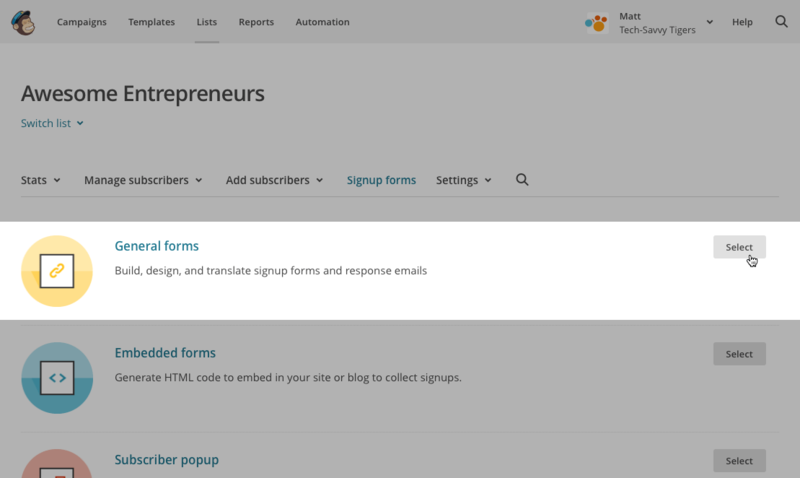 To access your MailChimp signup forms, choose Signup forms on the Lists page. Edit the General signup forms. On the “Signup forms” page, click General forms to edit your general signup forms. To edit your thank-you page, choose Confirmation “thank you” page from the “Create forms” menu. To edit your “thank you” page content, click the main content area. Add the text for your link to your thank-you page. 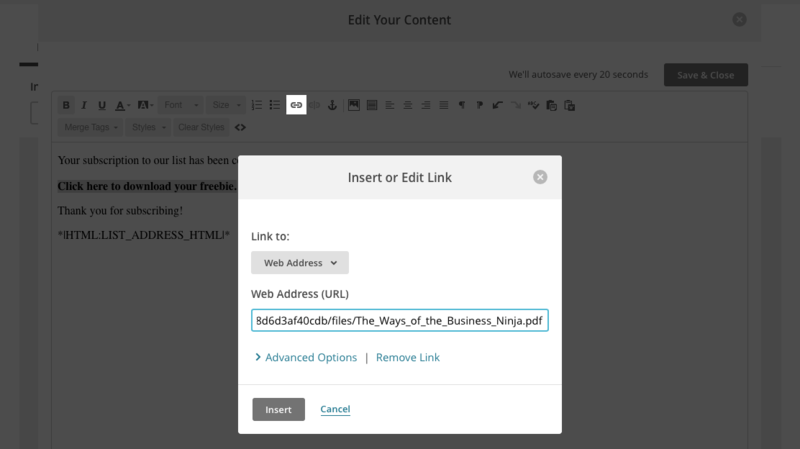 Enter the text you’d like to use for your freebie link, then click and drag the text to select it. Link the text to your freebie. Once you’ve selected your text, click the Link button then paste in the freebie URL you saved earlier. You’ve now linked up your freebie to your thank-you page. Now, when subscribers sign up, they’ll be able to click the link to download the freebie. Great work! Now your thank-you page contains a link to download your freebie. Finally, click the Save & Close button in the Edit Your Content window to close the window. Another nice touch is to send a final “welcome” email to a subscriber — containing your freebie link — once they’ve signed up. This makes sure that new subscribers don’t miss your freebie! To edit your welcome email, select the Final “welcome” email option. Edit the welcome email content. Make sure Send a final welcome email is selected, then click the dotted box to edit the email content. Add the text for your link to the welcome email. As before, type the text that you’d like to use for your download link (for example, “Click here to download your freebie.”). Click and drag over the text you just typed to select it. Your welcome email now contains a download link so that subscribers can easily download your freebie. Nice! 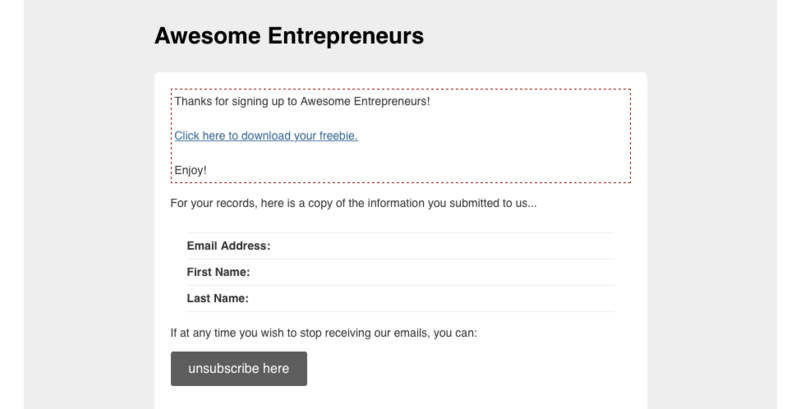 Your subscribers can now click the download link in their welcome email to download your freebie at any time. Great stuff! Now that you’ve set up your opt-in freebie with MailChimp, it’s a good idea to test it out by signing up to your list and making sure the download links work correctly. Make sure you sign up using an email address that isn’t already on your list! Alternatively, remove yourself from the list first (Click Lists > select Manage subscribers from the pull-down menu > click Unsubscribe people). If you already have a signup form on your website then you can skip steps 1-4 below. Instead, just use your website form to sign up. On the “Create forms” page that you used in the last step, click the big grey button below Forms and response emails once more. Choose Signup form in the menu that appears. Copy the signup form URL. 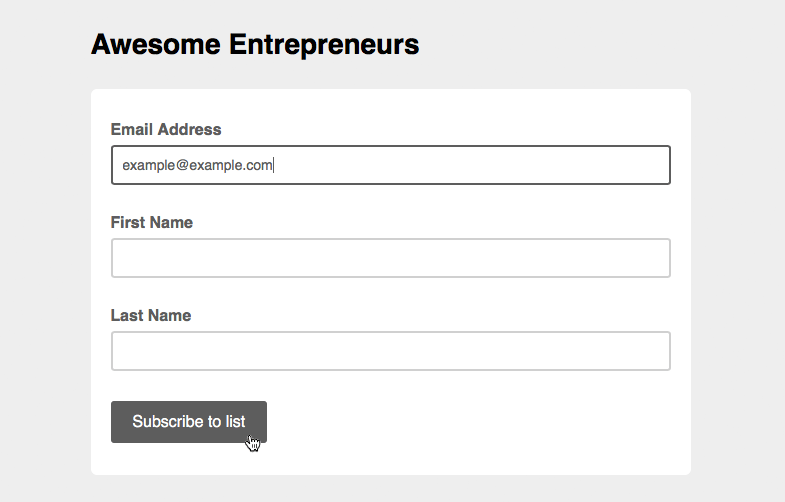 Select the URL for your list’s signup form, then choose Edit > Copy. Paste the signup form URL into a new window. Open a new browser window, then choose Edit > Paste to paste the copied signup form URL into the browser’s address bar. Press Return to display the form. Sign yourself up using your list’s signup form. When you receive the confirmation email, click the button to confirm your subscription. Test the download link in the thank-you page. Click the download link in the thank-you page to make sure your freebie downloads OK.
Test the download link in the welcome email. To test the welcome email, click the link in the email. Your freebie should appear in your browser or download to your computer. If all works well, then congratulations! You’ve set up your opt-in freebie in MailChimp. Give yourself a pat on the back! Set up your freebie in MailChimp today! 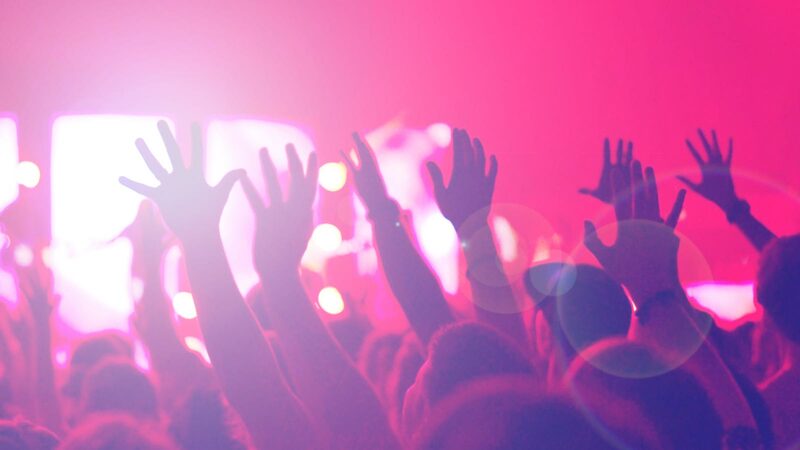 Getting your opt-in freebie up and running can seem daunting. You have to work out where and how to upload it, as well as how to make it available for your new subscribers to download. Luckily, as you’ve seen in this guide, you can do the whole thing in MailChimp. And it’s really quite straightforward. So grab a coffee. Dust off that eBook, worksheet or video that you’ve been wanting to use for your opt-in freebie. Upload it to MailChimp. Link it up. Tell everyone about your shiny new freebie on your website and social media. And watch your signup rate soar! Great article Matt! Loved the screen shots and simple instructions, well done. Does this work for the free version mail chimp? Yes it does Erin 🙂 Feel free to ask if you need any help setting it up. Hi Mat – thank you for your easy to follow instructions here – unfortunately I didn’t get the expected outcome. Two things I noticed – each time I changed the text on a form (eg. thank you form / welcome form) the same text appears on all the other forms (i.e. not customised for each form stage). Secondly, when I tested the process, the whole sequence emails/pages did not appear. I didn’t receive the thank you page with the download link. I even revised the process by adding the pdf (freebie) to a different form stage but I didnt get it either. It has taken me over two hours already to get this far. Is there a simple solution? It’s tricky for me to give an answer without seeing the problem myself. It sounds like you might have changed the text in the wrong place, but I can’t be sure. I’d need more information. If you’d like me to take a look at your MailChimp setup, please contact me directly at https://www.elated.com/contact/. 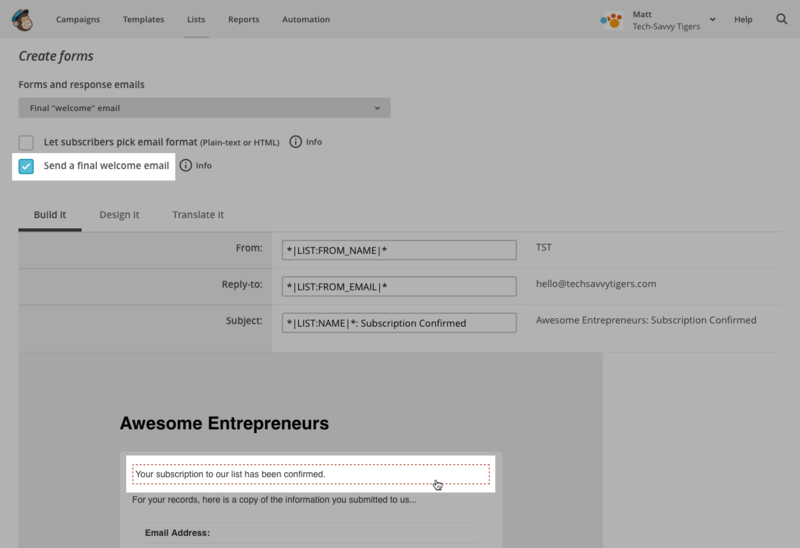 Question: what if I use the Mail Chimp Subscriber pop up form? Do I have to upload the freebie again or will it work automatically once they confirm their address and receive the final welcome email? It seems that I just have to add the code from ‘Generate code’ to my website. Is that correct? What else should I do? You’re welcome Nanou 🙂 The technique should still work, whether you’re using a regular in-page form or the Subscriber Pop-up form. 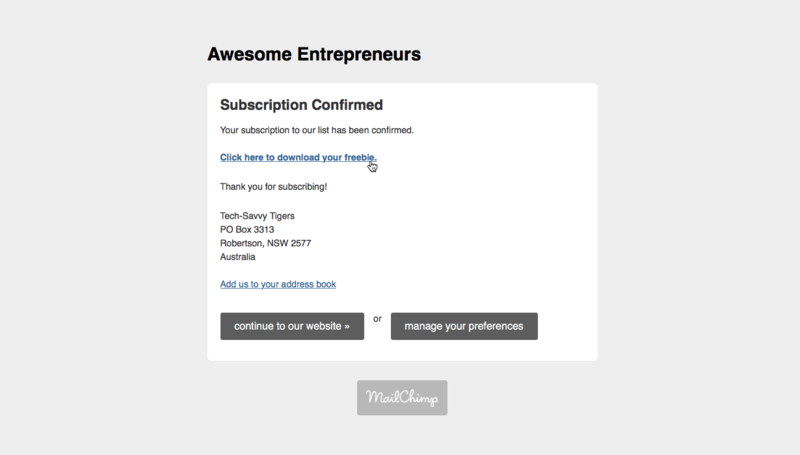 MailChimp should still give subscribers the thank-you page and welcome email containing the download links. I would test it first of course, just to make sure. And yes, you should just have to click the View Code button in the “Subscriber Pop-up form” designer page, copy that code, and paste it into your page (make sure you use the Text editor if you’re using a CMS like WordPress, not the Visual editor). Also don’t forget to click the Save and Exit link in the form designer to save changes to your pop-up form. Thanks so much for the quick reply. I saved and exited, I have the code but where exactly do I paste it in? Which page do you mean (with WordPress)? I tried the header and footer file, I tried the CSS section but it didn’t work…It slowed down the website and only a blank little square came up with a cross on it. It’s good to know though that Mailchimp should automatically link it and send the thank you email with the link. So I’d recommend avoiding this type of form on your site. Go with an embedded form, or a pop-up form that only opens when you click a button (such as we use on this site). I’m not tech savvy and this can seem like rocket science to me. This article was the best I’ve read on the subject – simple straightforward advice that’s easy to understand and implement. Thank you so much! Thank you SOOOO MUCH! This is EXACTLY what I was looking for. Thank you! Thank you so much! SUCCESS!!! I’ve learned so much from this blog and have everything in working order. This guide is MUCH easier to understand than the MailChimp Blog. My website is ALMOST FINISHED! I got invited to participate in a summit and had never set-up a freebie specific to an event. Your article helped a lot. Thank you! Hi Matt, amazing article. Thank You. I already have a subscribers box on my site for my blog. This is solely for those who want the freebie, but not to become a die hard subscriber. Is this option ok too? Thanks for your comment Jaiden. Sure, you can have a separate list for the freebie. In fact this is one of the ways you can offer multiple freebies to your readers — you create a separate list for each freebie, then you can merge subscribers into your main list if you like! Thank you thank you! I’m clueless on Mail Chimp. I redesigned my website and wanted to update my freebie, but I had no idea where to start. This post was exactly what I needed. This is great content, thanks Matt. I was wondering how to add this form as a pop up instead of in every page. I’ve been researching for a while now so your help is much appreciated. I think our optin form originally used Bloom ( https://www.elegantthemes.com/plugins/bloom/ ), but I ended up rewriting it so we could do multiple optin freebies with MailChimp. Maybe I’ll write an article on that one day! Thank you Matt! Your post was a real life-saver for me. I read several posts on this topic but kept getting stuck at some point or the other. I went through your step-by-step guide and FINALLY managed to get from A to Z. My opt-in is up and I couldn’t be happier. Thank you so much for taking the trouble to put this guide together. Thank you so much. This was simple and straightforward. It was useful. Thank you for this article. It’s an easy read and hoping it will be easy to follow when I go to add an ebook or PDF as a freebie opt-in on my website. Which, brings me to my question, will these same steps work on my free Wix website? I’m just starting out with my online health coaching business. Wow! Thank you so much for your quick response and for your help. I’ll try the tutorial tomorrow and will definitely let you know! Thanks again! Oh wow! I feel totally accomplished right now! Thank you so much for the clear, easy steps to setting up MailChimp with my wix website! It all worked superbly! Thank you again! Am I to assume that as people begin to subscribe, there’s away for me to see and track? When it comes time to remove my opt in on my wix website, is there a way to do that? Thank you so much in advance for your help! What a brilliant article. Thanks for making it so straight-forward. It all worked beautifully for me, except that I haven’t received the final confirmation email from Mailchimp. I don’t know why. Can I add my opt-in to my facebook page somehow? Also, how do I now put this onto my wordpress site as an opt-in? Thanks again. Did you select the “Send a final welcome email” checkbox in MailChimp? It might also be worth checking your junk/spam folder to see if the welcome email turned up there. 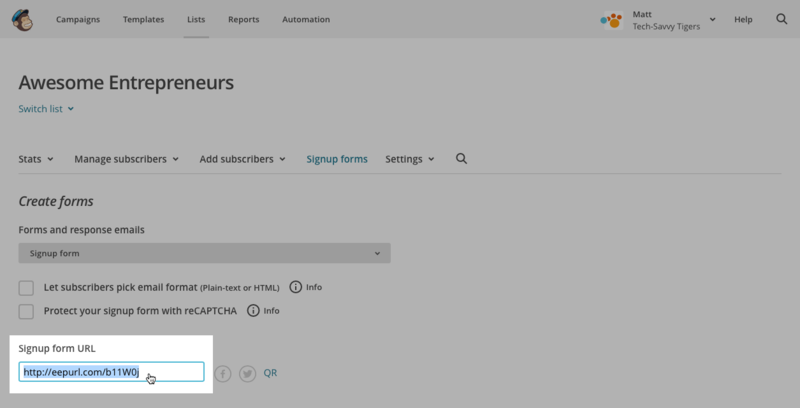 You can add a MailChimp signup form to your WordPress site using a plugin such as this one. And here’s how to add the signup form to your Facebook page. Unfortunately, by using the embedded sign up form on my website it won’t take me to the thank you page. Is there any way to embed a general form or link the embedded form to the thank you page? Thanks! Thanks for your question. Is the embedded form using Ajax? If so then try turning off the Ajax option (if possible). 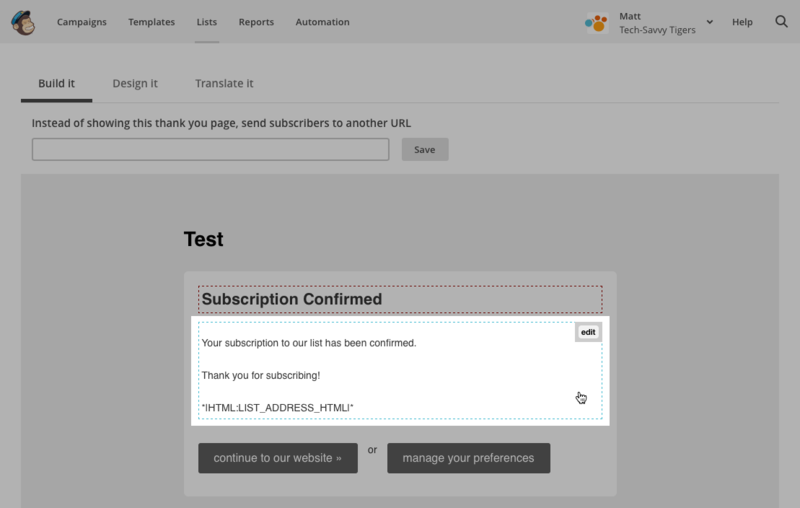 This should allow MailChimp to redirect you to the thank-you page on signup. This was so easy to follow and now I feel like I know what I’m doing! Thank you! Thanks Jacinta! 🙂 The only way I’ve found to do this in MailChimp is to have multiple lists (1 list per freebie), with a separate landing/thank you page for each list. Then, whenever you want to send a mailout to your main list, you first move all the new subscribers from your various freebie lists into the main list. It’s a bit of a pain but it works! Thank you so much for this great article! This finally helped me get a freebie set up on my website. I can’t tell you how confusing other articles I read were. This just set out the steps plain and simple! Hi! So I have a blog related to travel and Instagram help/growth guides. I want to create 2 freebie opt in’s – one related to travel and one related to Instagram and then segment my list based off of which freebie they choose. How do i do this?! Thanks! 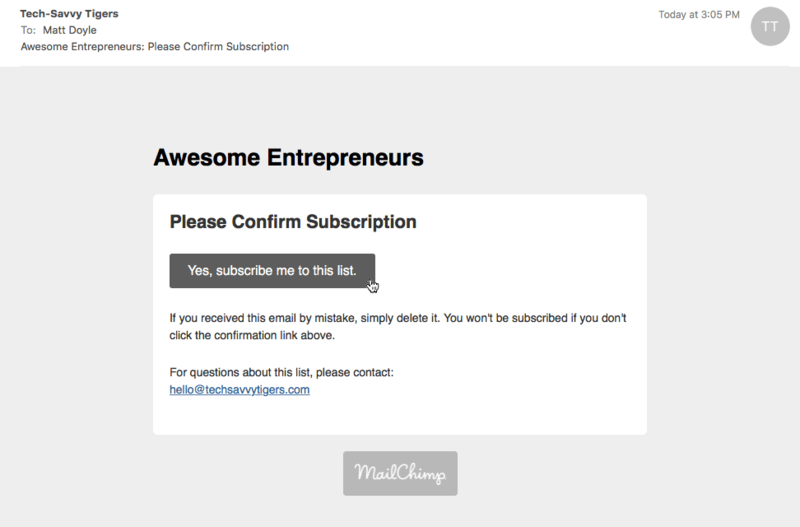 Hey Laura, in MailChimp you need to create 2 lists to do this (1 freebie per list). Thank you so much for this information! Quick Question which you’ve probably already answered but I still need more clarification on offering my opt-in freebie. I would like to have subscribers give me their information first (name & email) for them to download the opt-in freebie. The link is going on my Instagram as I am not embedding it onto a website or blog. Since it’s not a “Welcome or “Thank You” What type of opt-in would I used to attach the freebie ~ a landing page, lead or subscriber opt-in? Then would I still have a Thank You after they download the opt-in? Thanks for your question. Yes, you can host your freebie on Instagram (although subscribers will be taken straight to the freebie rather than a thank-you page). To do this, click Lists in the top MailChimp menu, then click the down arrow to the right of your list and choose Signup Forms. Click Form Builder then, in the drop-down menu below “Forms and response emails”, choose “Confirmation thank you page”. Copy the URL of your Instagram freebie, then paste it into the “Instead of showing this thank you page, send subscribers to another URL” box, then click Save. Subscribers will then be taken straight to your freebie, instead of seeing a thank-you page! You are an awesome human being, thank you so much for this article. Easy to follow and everything has worked perfectly. I very much appreciate you spreading your knowledge to help others.